According to the Flyers website, the team underwent an extensive process to develop Gritty, enlisting the help of Dave Raymond during the 2017-18 regular season. The process included evaluating over 100 different designs. 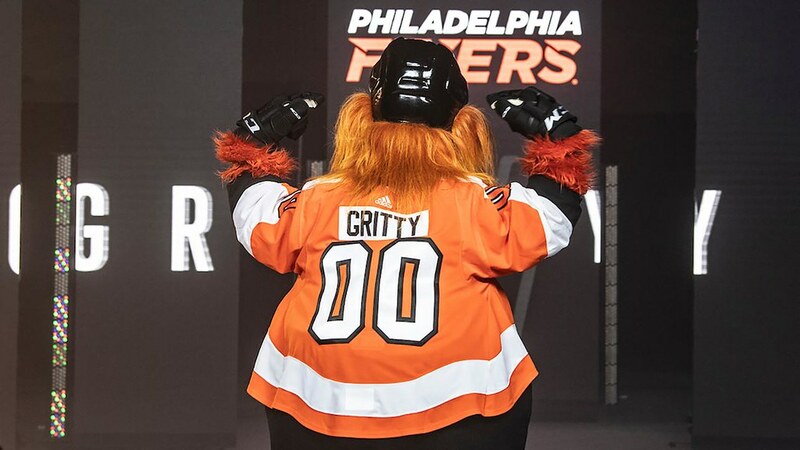 On Monday, the Philadelphia Flyers unveiled the team’s new mascot, a bodacious orange beast who goes by the name of Gritty. 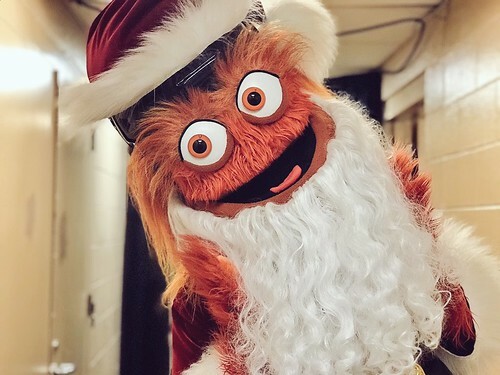 With googly eyes, a toothless grin and a beard that could give Brent Burns a run for his money, Gritty has the potential to haunt the dreams of children for ages — or not. Gritty is fun and exactly what Flyers fans need to lift their spirits after a disappointing first-round playoff exit in April. During Monday’s Flyers game, Gritty wiped out on the ice spectacularly, leading to the moment being recorded for all time in the form of slow-mo gifs and screenshots posted on Twitter. The round, orange behemoth slipped while on the ice without skates and did his best imitation of a turtle on its back. Several staff members looked on in worry at the sight of Philadelphia’s newest friend, laying on his back on the ice, t-shirt gun still in hand. Falling couldn’t wipe out Gritty’s enthusiasm for Flyers fans. Gritty continued to be a source of amusement for fans watching the game, as he shot one of the Flyers’ staff members in the back with a t-shirt gun during his on-ice debut. (Keep your eye on the guy in grey). Gritty is bold, beautiful and body-positive. The New Jersey Devil, with his six-pack, is a reminder of body standards that most people struggle to reach. But Gritty, with his pear-shaped figure and unconventional looks, sends the message to hockey fans that there’s no one shape for a fan to be or look to have. Fans come in all shapes and sizes. And despite any blowback Gritty has received, he remains confident and proud of himself. And besides, who couldn’t love a mascot that signs off for the night with a recreation of the most iconic Kim Kardashian photo of all time? Gritty may not seem like the mascot any of us wanted, but he is the mascot we need. And I, for one, welcome Gritty to the NHL and am excited for his future. Gritty was busy over winter break. 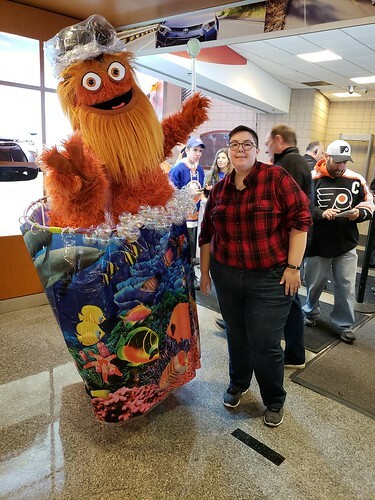 Copy Desk Chief Bridget Dolan makes the case for Gritty to run in 2020.